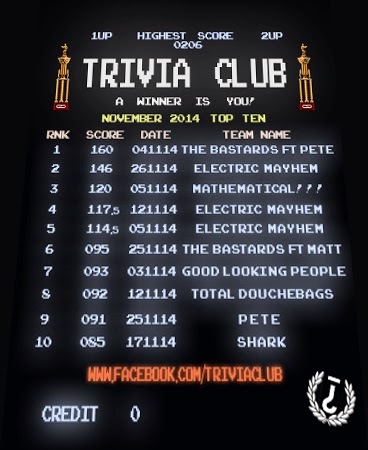 November was a month dominated by two specific teams in the Monthly Scoreboard, those being The Bastards at Trivia Club's Lou Dawgs location, and The Electric Mayhem at the original home of Trivia Club at Cardinal Rule. And wouldn't you know their was even some crossover, as Electric Mayhem team member Matt Smith even joined The Bastards on the 25th of November! If you include PETE's solo victory within The Bastards/Electric Mayhem venn diagram of dominance this November, since he has been featured along-side Lou Dawg's winningest team as of late, that's SIX spots in the Top Ten! Speaking of multiple appearances, last month's only two-timer on the list The Rusty Trumpets failed to crack the Top Ten, though Those Good Looking People In The Corner and SHARK who both won the Golden VHS at Hitch in November DID in fact crack the Top Ten! The month's highest score of 160 courtesy of The Bastards feat. PETE, is not only the highest score of the month at Lou Dawg's Ryerson, but was also the most recent high score to crack the Sesquicentennial Mark since PETE did so at night two of our Christopher Hitchens Cup at Hitch! The most recent team to crack the mark before PETE? The Bastards at the second ever edition of Trivia Club at Lou Dawg's Ryerson! The Electric Mayhem took home the top score at Cardinal Rule this month with 146, four points short of becoming their seventh Sesquicentennial Marker, and Those Good Looking People In The Corner took home the month's highest score at Hitch for November!